 The Ploughman’s Lunch, a staple lunch in Britain for centuries (photo courtesy Taste | Australia. 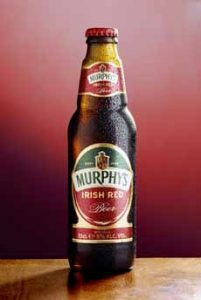 Have an Irish beer with your lunch (photo courtesy Murphy’s Irish Stout). For St. Patrick’s Day, how about a Ploughman’s lunch? You can bring it to work or dig in at home. Pronounced “plow man,” Ploughman’s, as it’s called for short, is a cold lunch that farmers (the plow men) and other laborers in the British Isles (including Ireland), out for the day, would take with them. The lunch included bread and butter, cheese (cheddar, stilton or other local cheese), relish such as a Branston pickle (chutney),* piccalilli* and/or pickled onions. A deluxe version might include ham, hard boiled eggs, a green salad and an apple. The ploughman’s lunch entered pub menus as an inexpensive meal. Today’s ploughman’s lunch at a pub or café can add a green salad, celery sticks, hard-boiled egg, beet salad, pâté, potato chips and sliced apple. At home, you can add caramelized onions, tapenade and/or chutney. We also like to add a chicken-and-apple sausage. Dress your salad with a Dijon vinaigrette. For St. Patrick’s Day, substitute Irish soda bread for everyday bread. There’s not much mystery to it: bread and cheese were the basis of a poor person’s diet, and was what rural English labourers carried when they left the house [source]. A reference as far back as c.1394 mentions the traditional ploughman’s meal of bread, cheese and beer. Meat was a luxury, so cheese provided the protein. The cheese, plus butter or lard for the bread, provided fats. Onions and leeks, served as a condiment, when more expensive seasonings and condiments were out of reach. Over the years, the romance of “the rural life” led middle-class people to embrace the Ploughman’s Lunch. See if your local Irish pub offers it. *Branston pickle is a chutney typically made of carrots, cauliflower, gherkins, onions and rutabaga, pickled in a sauce of vinegar, tomato, apple and dates flavored with chutney spices such as mustard, coriander, garlic, cinnamon, pepper, cloves, nutmeg and cayenne pepper, plus sugar. British piccalilli is similar but tangier, less sweet, and colored bright yellow with turmeric.